Have you ever proclaimed your love for a snack food so often and openly that your friends would make jokes like, "Those guys ought to be paying you!"? Nick Kroll has, and now he's getting paid fat stacks of cash. For years, for no financial remuneration, Kroll extolled the virtues of Take 5 candy bars -- across the social media landscape and, presumably, in real-life conversations with friends, colleagues and strangers at bus stops, free clinics, etc. Word of Kroll's infatuation eventually reached the folks at Hershey, who were so delighted they recently decided to make the relationship official. 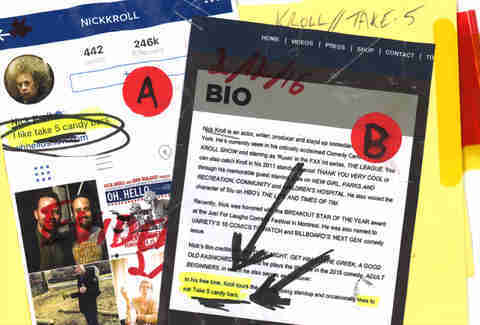 Kroll told us his rationale for the website bio was twofold: listing credits and accomplishments can be "embarrassing," and by mentioning Take 5 he's also giving gentle guidance to fans and friends who might decide to bring him a snack on tour stops. As for the Instagram shout-out, it's definitely a more valuable snippet of personal information than political beliefs, or the fact that you're "living life every day." Mentions outside of his own social channels begin popping up a little over three years ago, starting with a column on the 2012 presidential election written for Marketplace -- titled "Nick Kroll's two cents on the 99%, 47%, and the Take 5 candy bar" even though Marketplace only solicited his opinion on the first two topics. Kroll: “You know, the five people that respond to your podcast, at least one of them is going to be like 'Finally, someone is talking about the Take 5 candy bar...'"
But eventually it becomes a very serious-ish discussion comparing the bar's inexplicable underratedness to a baseball team with enough talent to win the Series but not enough reputation to be consistently discussed in conversations about... baseball (we're looking at you, south Florida). Clearly, this is more than just a candy crush -- those are really serious things. However, Kroll, who unsurprisingly also loves sports analogies, demurs when asked which ingredient he prizes most. Instead he maintains that it's more appropriate to think of how, as with that basketball team the U.S. sent to Barcelona in 1992, the whole is greater than the sum of the parts even though the parts are some of the best parts to ever play the game/be eaten at 4:17pm when you're really hungry but it's too early even for old-folks dinner. While the genuineness of Kroll's affection appears to be unimpeachable, the comedian does admit that being a cult follower of an under-appreciated snack food does provide a certain amount of hipster cred. "I’m not a big music guy, so for me Take 5 is like being into an obscure indie band," says Kroll. "So your friends are like, 'Oh I love the Arctic Monkeys,' and I’m like, 'Well I love Take 5 candy bars.'" Hot as ****. I mean, it's all there: That tiny pursed-lip smile he does when he finishes a joke and thinks it’s just as funny as you do. The obsession with football that gives you an excuse to eat tiny pieces of bone-in chicken for free every weekend... He's everything a girl could want, and more. Oh, scratch that, I forgot -- he loves Take 5 candy bars. He is everything a girl could want. The lesson: if you love something very much, and the thing in question is legal, tell people about it a lot and the love will come back to you. And also money.